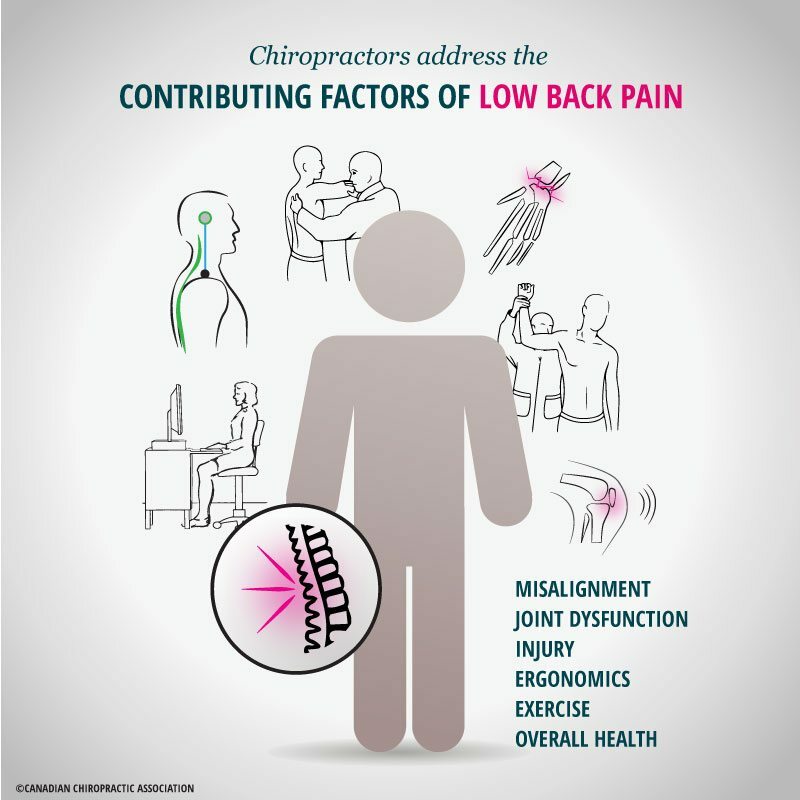 Low back pain is a complex condition with multiple contributors to pain, including physical, social and psychological factors. Lifestyle factors, such as obesity and being sedentary are associated with the occurrence of low back pain as well. Our backs play a supportive role for our bodies – at rest and in motion. Extra bodyweight puts greater demand on our spines and other joints. Research shows that a higher Body Mass Index (BMI) increases the risk of suffering low back pain. With growing rates of obesity , Canadians are increasing their chances of developing low back pain. In addition, we are more sedentary than ever before. In industrialized countries, 75% of workers sit for long periods of time. Prolonged sitting may negatively affect your muscles and joints and lead to deconditioning (decline in physical functioning), fatigue and stress on the spinal discs causing pain in the lower back. In an effort to combat sitting, newer products such as standing desks, have been increasing in popularity. However, recent research produced at the University of Waterloo also found that standing desks may lead to lower back pain as well. The key take away message as discussed by Daniel Viggiani, lead author, is that regardless of whether you are sitting or standing at work, make sure to move around and shift your posture often. Low back pain has also been one of the key drivers for opioid prescription. With increasing awareness of its risks, limited efficacy and potential for misuse, emerging evidence has suggested that medication should not be the mainstay in the treatment of low back pain. Instead, recent guidelines recommend self-management, manual therapy, physical activity and psychological therapies. There is a shift in placing less emphasis on pharmacological and surgical interventions in the care of low back pain. Canadian chiropractors are trained to assess and diagnose back pain, as well as offer comprehensive treatment plans. Typically, plans are holistic. A chiropractor addresses all contributing factors of low back pain, such as joint dysfunction, injury, ergonomics, exercise and overall health and then develops a customized program to relieve pain, increase mobility and get you back on your feet. Chiropractic treatment is a drugless and non-invasive treatment option. Chiropractic treatment relieves low back pain using effective clinical tools like manipulation, mobilization, soft tissue therapy, exercise, patient education, modalities (i.e. ultrasound, laser) and rehabilitation. Extensively trained in spinal manipulative therapy (SMT), chiropractors are proficient in providing specialized care which has been proven effective in reducing pain, improving function, and decreasing the chances of low back pain becoming a chronic condition. Click here to read more about how chiropractic expertise in treating low back pain can ease pain and lower your risk of recurrence. Canadian chiropractors can provide education on your spine and posture, as well as create a personalized treatment plan including back exercises and ergonomic solutions for your workstation. Find a chiropractor today and join the other 4.5 million Canadians visiting their chiropractor each year! Find out about insurance coverage for chiropractic treatment here. GBD 2015 Disease and Injury Incidence and Prevalence Collaborators. Global, regional, and national incidence, prevalence, and years lived with disability for 310 diseases and injuries, 1990-2015: a systematic analysis for the Global Burden of Disease Study 2015. Lancet. 2016 Oct 8;388(10053):1545-1602. Hoy D, Bain C, Williams G, March L, Brooks P, Blyth F, Woolf A, Vos T, Buchbinder R. A systematic review of the global prevalence of low back pain. Arthritis Rheum. 2012 Jun;64(6):2028-37. doi: 10.1002/art.34347. Epub 2012 Jan 9. Review. Angela Maria Lis, Katia M. Black, Hayley Korn, Margareta Nordin, Association between sitting and occupational LBP, Eur Spine J. Feb 2007; 16(2): 283–298. Borgundvaag B, McLeod S, Khuu W, Varner C, Tadrous M, Gomes T. Opioid prescribing and adverse events in opioid-naive patients treated by emergency physicians versus family physicians: a population-based cohort study. CMAJ Open. 2018 Mar 1;6(1):E110-E117. Traeger AC, Buchbinder R, Harris IA, Clavisi OM, Maher CG. Avoid routinely prescribing medicines for non-specific low back pain. Br J Sports Med. 2018 Mar 7. Bussières AE, Stewart G, Al-Zoubi F, Decina P, Descarreaux M, Haskett D, Hincapié C, Pagé I, Passmore S, Srbely J, Stupar M, Weisberg J, Ornelas J. Spinal Manipulative Therapy and Other Conservative Treatments for Low Back Pain: A Guideline From the Canadian Chiropractic Guideline Initiative. J Manipulative Physiol Ther. 2018 Mar 29. Almeida M, Saragiotto B, Richards B, Maher CG. Primary care management of non-specific low back pain: key messages from recent clinical guidelines. Med J Aust. 2018 Apr 2;208(6):272-275. Foster NE, Anema JR, Cherkin D, Chou R, Cohen SP, Gross DP, Ferreira PH, Fritz JM, Koes BW, Peul W, Turner JA, Maher CG; Lancet Low Back Pain Series Working Group. Prevention and treatment of low back pain: evidence, challenges, and promising directions. Lancet. 2018 Mar 20.